Endless days of hot sunshine…this is not really the case here in the Highlands but I’m enjoying lots of smoothie jars to make me feel more summery. I love smoothies, they are a great way to start the day, starting your day packed full of vitamins and minerals. At the moment my favourite just contain fruit and vegetables but no dairy as in the summer I like my smoothies to feel really fresh. Strawberry smoothies always remind me of revising for my GCSE exams as my sister and I would have a strawberry and lime smoothie everyday for lunch, followed by a white chocolate magnum! I have had lots of smoothie bowls for breakfasts but I’m really enjoying smoothie jars at the moment which seems silly as they contain the same elements it is just the jar that is different! 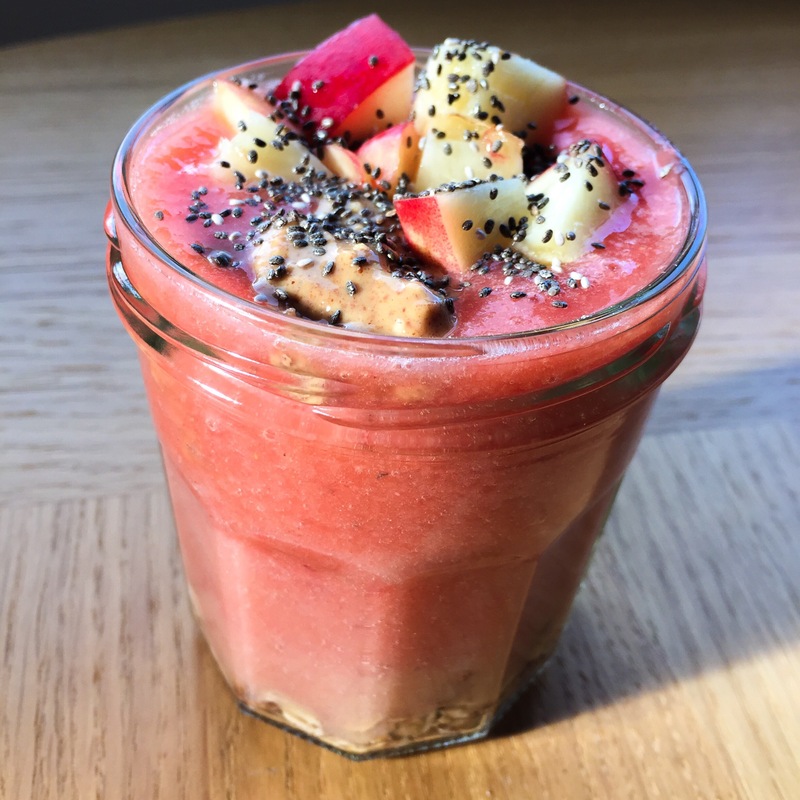 Smoothie bowls or jars are brilliant as you can add anything you like to make your smoothie even better. I love them as they add texture and a different dimension to smoothies. Homemade granola, nut butters, seeds, fresh fruit can all be added to really enhance your smoothie. The one below contains strawberries which goes really well with peanut butter (I’m now daydreaming about peanut butter and jelly sandwiches), it also has a layer of my home granola at the bottom and topped with fresh white nectarines. You can change this and add your favourite granola, fruit, nuts so that it is perfect for you! Place all of the fruit into your blender/smoothie maker and blitz until smooth. 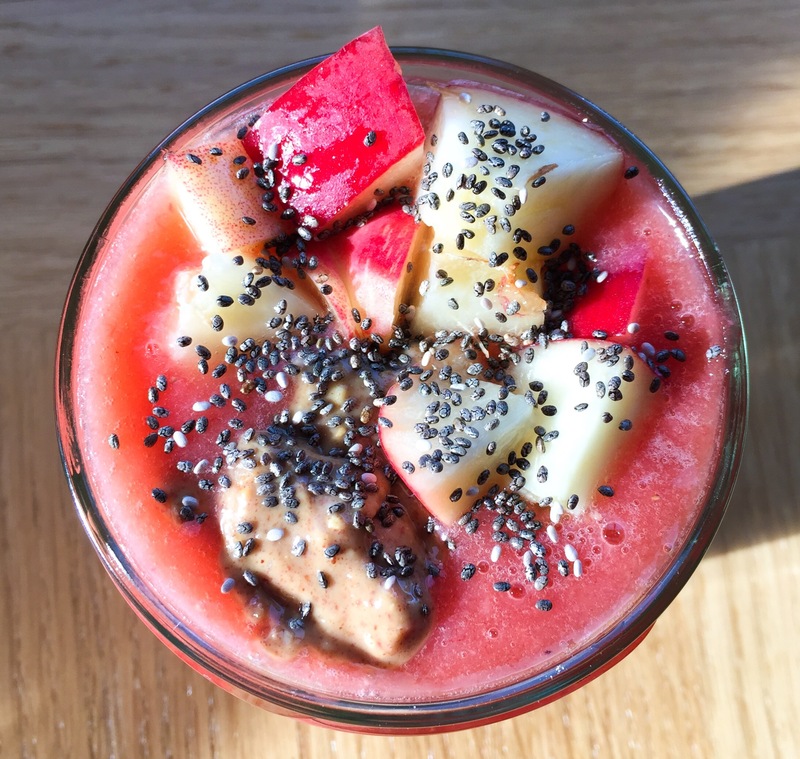 Place you granola at the bottom of the jar, pour the smoothie on top, then top with the peanut butter, fresh nectarine pieces and chia seeds.